Grab the brakes or whack the throttle while leaned, Bosch has your back. Rain or shine. 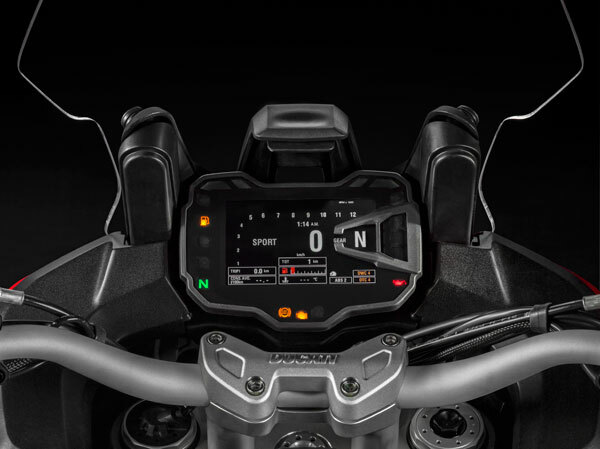 The newest Ducati Multistrada has super sophisticated Bosch Traction Control and ABS electronics. These rider aids will make it a whole lot harder to crash! But, are they all they are cracked up to be? The Bosch electronics I tested at the Bosch proving ground near Detroit included updated ABS with Combined Braking Systems (eCBS), Ducati Wheelie Control (DWC), Lift (Stoppie) Control, Ducati Traction Control (DTC) and Cornering ABS, aka Motorcycle Stability Control (MSC). The straight-line ABS is nothing particularly new, but the introduction of corner sensitive traction control and Corner ABS certainly is. The brain behind this technology is the Inertia Measuring Unit (IMU) that can detect angles of roll, yaw, and pitch. With this data, the ABS and Traction Control systems can intervene to prevent many crashes caused by over-exuberant braking or throttle inputs. Without the IMU, TC and ABS cannot detect and then intervene to arrest traction loss that includes a lateral slide. With the lean-angle sensitive IMU, it can bleed engine torque or brake power if it detects abrupt changes in pitch, lean or direction. Cool, huh? Wet tile with ABS OFF. Disclaimer: The system I am reviewing here is the latest technology found on only a few 2014-2015 machines. Older and less sophisticated electronic aid packages without the benefit of a lean-angle sensitive IMU will not perform the miracles I am about to describe. To test the traditional straight-line ABS I made several high and low speed runs on gravel and wet and dry pavement. The ABS never let me down. Riding on a wet tile runway with ABS switch off caused the bike to slam onto the sturdy outriggers with just the touch of the brakes. It was possible to apply the brakes without skidding, but it took all the brake feel and control I could muster. With ABS switched on, I was able to grab the brakes and the bike remained balanced on two wheels. Wet tile with ABS ON. Riding on the gravel course further confirmed the effectiveness of the ABS as the bike to remained upright even when applying copious amounts of front brake pressure. Set to Enduro mode, rear brake ABS is disabled to allow direction changes using a locked rear wheel …fun, but not something I recommend on a 511-pound motorcycle with street-biased tires. Testing the Cornering ABS (what Ducati calls Motorcycle Stability Control or “MSC”) required me to grab the brakes as hard as possible while fully leaned in a corner. Really? It was nearly impossible to toss aside decades of instinctive emergency corner braking technique and common sense to do this test. Normally I would reduce lean angle before (or while) applying the brakes. Instead we were told to jam on the brakes and hold lean angle as long as possible. Demo of Cornering ABS. Bosch photo. I held my breath and headed for the curve before I leaned hard and went for it. It worked! Not only did the MSC manage the available traction, it also allowed me to slow rapidly while maintaining the path through the curve; no more crossing into the oncoming lane or hitting a guardrail in an emergency corner braking situation. Trying this on dry pavement was unnerving as hell, but a passing shower meant that I got the chance to test this mind-bending system in the rain. This maneuver went against all of my instincts but once I trusted the system I was sold! After the MSC test, I set out to further tax my nerves by testing the Ducati Traction Control (DTC), which consisted of whacking the throttle open in second gear at 37+ degrees of lean. Instead of a nasty crash, the rear drifted controllably with the rear tire slipping and gripping predictably. Look at me, I’m Valentino Rossi. But, the TC isn’t foolproof. During one run, I made a particularly abrupt throttle input while dragging the footpegs (crazy, right?) that caused the rear tire to swing a bit farther than comfortable, prompting me to instinctively reduce throttle enough to regain grip. The next time, I was determined to stay on the gas to see if the system would sort things out. I can’t be 100% sure whether I was a bit more cautious or the electronics reacted quicker, but this time the bike remained in control as I blasted out of the corner. Somewhere in there are a bunch of electronic doo-dads that I hope can stand the test of time. Reliability: Motorcycle electronics seem to be the Achilles Heel of reliability, so skepticism about reliability is understandable. But, consider that solid state technology has no switches, relays or moving parts to fail compared to mechanical devices, and connections are designed and tested to prevent dust and water infiltration. Also, other electronic units, like ride-by-wire throttles, have no cables to break. In the event that a fault does occur, “limp-home” mode will allow you to get home. Will it fail? At some point, probably. But will it render the bike useless, probably not. Electronic intervention will interfere when I don’t want it to: Older, less sophisticated systems have fewer options and have been known to get in the way. But, with the wide range of intervention levels to choose from with the latest systems, it’s hard to think there isn’t a setting that suits almost any rider. It’ll take time to really learn what these systems are capable of and to find your perfect setup. Electronics will interfere with the essence of riding a motorcycle: Contrary to what a lot of Luddites and Skeptics think, these systems can be set to lurk in the background, never impeding with normal riding situations. I believe these systems enhance riding and can be set to your liking to never (or rarely ever) get in the way of riding enjoyment. Advanced traction control make advanced rider skills obsolete: I don’t see rider technique becoming obsolete any time soon. To avoid close calls and crashes, riders must have strong control skills and effective survival strategies. You can still careen into a Buick or off a cliff, just like before. 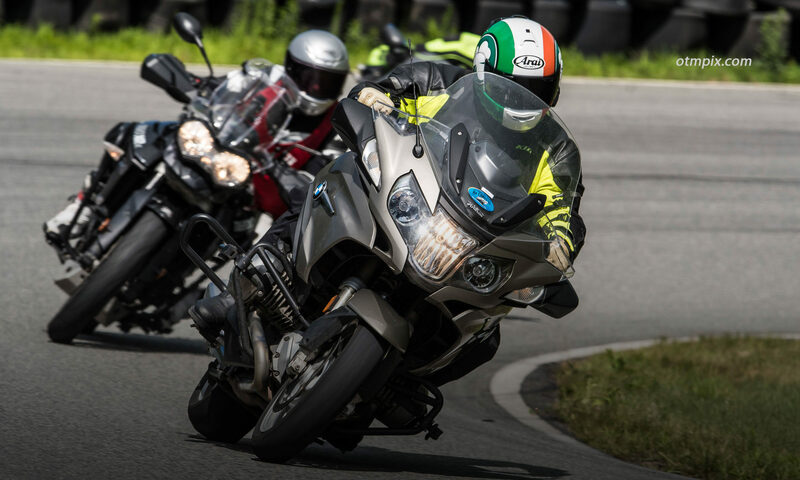 While TC will manage traction loss from clumsy braking and throttling, riders will soon learn that getting the most out of their motorcycle comes from smooth, well-timed rider inputs and not electronics. Electronic aids will encourage bad riding: It is possible that these electronics can encourage risky behavior as people discover just how competent these systems are. What’s to stop someone from relying completely on the TC to manage grip while powering out of a turn, or letting the ABS manage grip as he trailbrakes hard into a turn? TC and ABS may help prevent a crash, but will not to lead to better riding skill or faster lap times. Good technique still trumps electronic aids. Just ask the Moto GP guys. And remember, electronics cannot fix stupid. Electronic aids can lead to false confidence: Yes. I can personally attest that a false sense of confidence is possible. After fully testing the MSC, ABS and advanced traction control I was somehow fooled for one moment into thinking that the bike was not crashable. Of course, I was wrong! It’s important to remember that these systems manage available traction under braking and acceleration; they do not create more traction! You cannot expect to magically lean onto the edge of your tire over sand or dip into a corner over gravel and come out unscathed. Despite looking like a Star Wars console, the Ducati interface is quite easy to use. One of the most important selling points of the Bosch rider aids is safety. But, these systems cannot influence all crash factors, nor are they able to correct for bad decisions like excessive speed or bad lane position. Riders must still rely on good technique and judgment to prevent most crashes from occurring. The smartest riders will never need these systems as they continue to use traction management techniques like smooth, progressive brake and throttle application. Whether you have new-fangled IMU-based electronics or basic ABS, you should take time to practice maximum braking to the point where ABS kicks in. Without finding that limit, you will never trust that you can brake as hard as the system allows and not likely use the total amount of stopping power available when you need it most. Braking that hard is unnerving at first, but trust me the system will intervene.